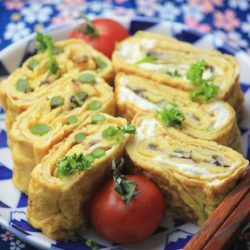 I think rolled omelettes are the most popular food here in Japan when it comes to making your lunchbox. 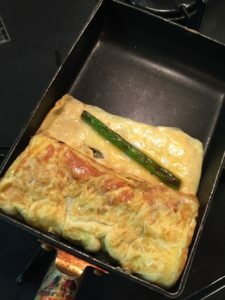 Every mother will cook a fresh omelette every morning and put it in the bento box of each of her children and husband. 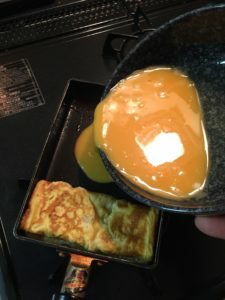 These omelettes are made using a rectangular frying pan (can be purchased here), using eggs, soy sauce, and sugar. 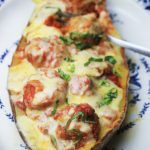 They can either be plain or with added vegetables, meat, or cheese inside. 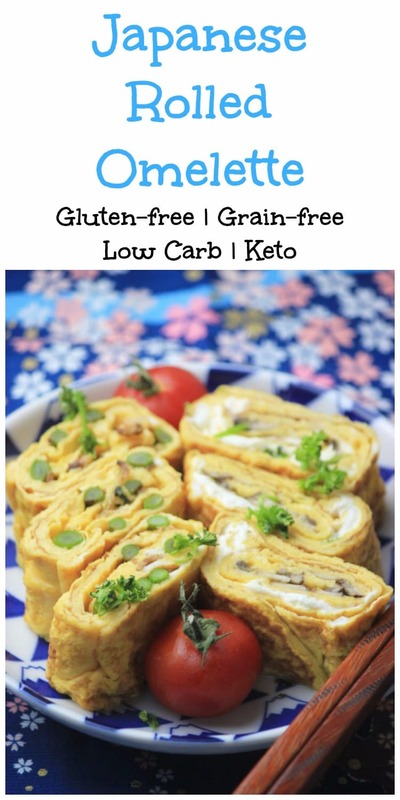 For this recipe, I will be introducing a soy, gluten and sugar-free version of the Japanese rolled omelette. 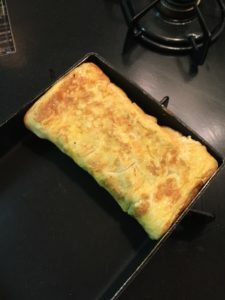 Making this omelette for the first time can be a little tricky, so I included a little picture tutorial of every step that I did for this recipe! 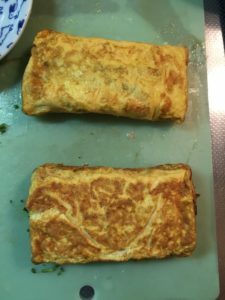 I made 2 omelettes, one with goat cheese, crimini mushrooms, and parsley. The other with asparagus and pre-cooked bacon bits. 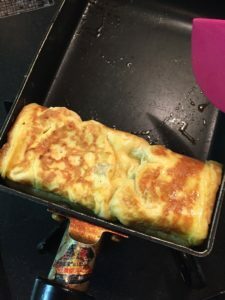 You don’t necessarily need to add the stevia and coconut aminos, this omelette could be any flavour you want it to be, but I like my rolled omelettes on the sweet side so I always add some to the eggs. 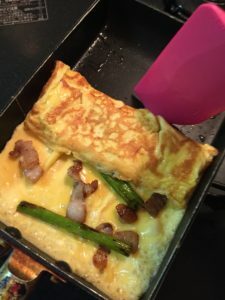 It’s important that you buy the non-stick rectangular pans or else your omelette may stick to the bottom! I do use ghee/coconut oil/olive oil as a precaution though. 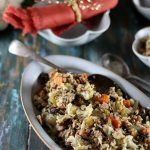 You can experiment with different fillings like different types of cheese, ham or ground beef, peppers, onions, olives, spinach, mushrooms, and the list goes on! 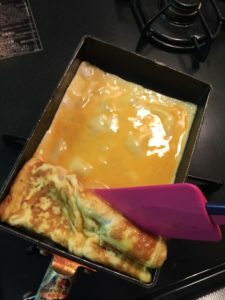 These omelettes are so versatile and fun to make! 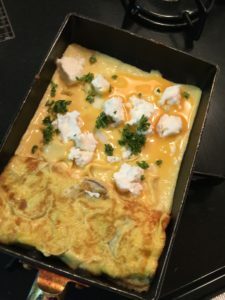 The omelettes themselves are really low-carb and low-calorie, perfect for the keto diet or paleo, but the calories/carbs will obviously increase when you add different fillings! So just make sure to count the nutritional value of those too! 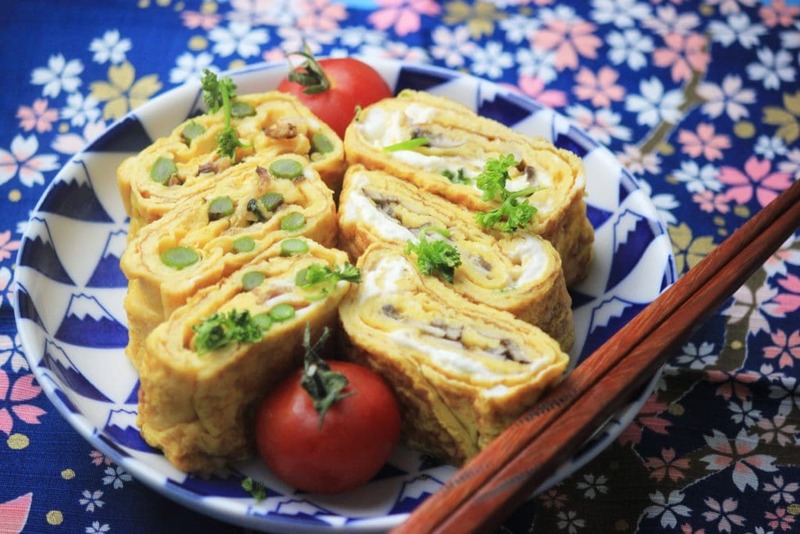 A gluten, soy, and sugar-free alternative to the popular Japanese rolled omelette! Thinly slice the mushrooms and mince the parsley stem. In a large bowl, crack the eggs open and add the coconut aminos and stevia. Mix well with a whisk. 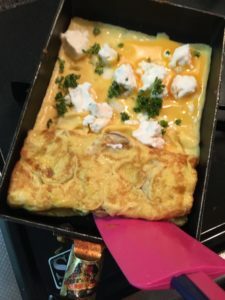 This egg batter makes 2 omelettes. 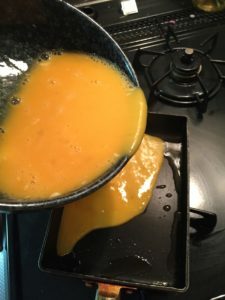 Heat a tsp of ghee on medium-low heat into your pan and spread it around. 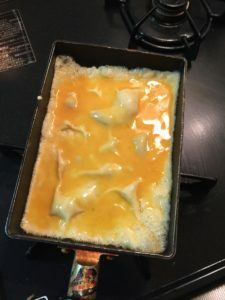 Add 1/6 of the eggs into the pan and make sure all areas are covered. 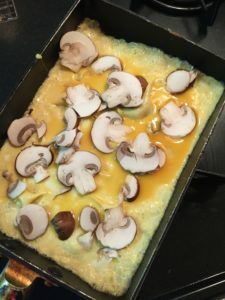 While the omelette is cooking, add 1/2 your mushroom slices all around. 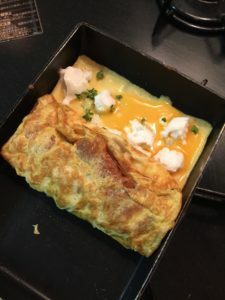 Once you can't see any runny egg on the surface of the omelette, you'll want to flip it. 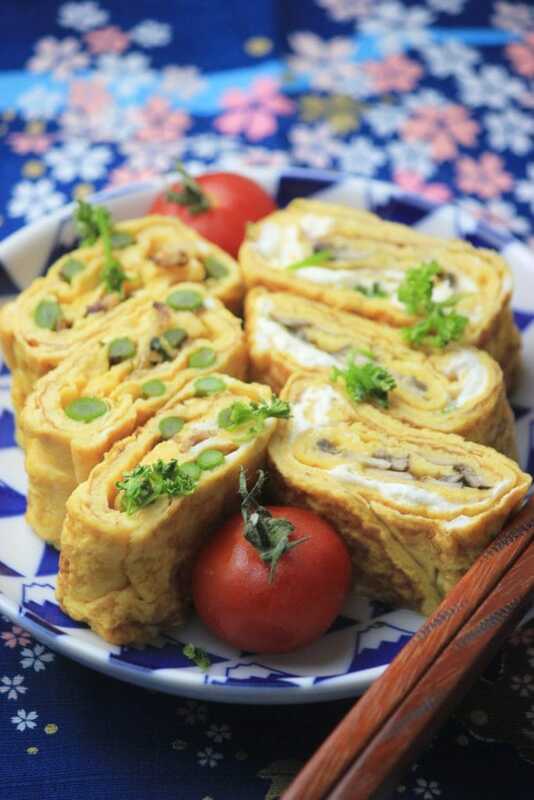 Using a silicone spatula, carefully roll the omelette around 2 times to one side of the pan. Add another 1/6 of the egg mixture to the pan. 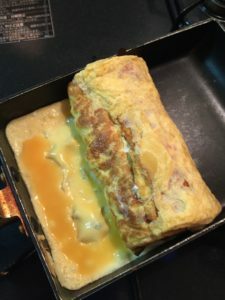 Carefully lift the omelette and make sure that the newly added egg mixture flows under the omelette so that each "layer" stick to each other. While the new layer is cooking, rapidly add 1/2 your goat cheese and parsley. 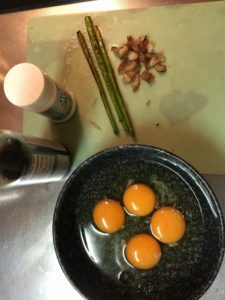 When the egg is done, roll again. 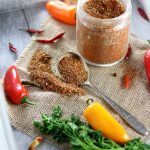 Repeat this step with the last 1/6, but don't add any ingredients. 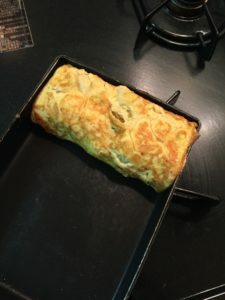 Roll your omelette completely and place on a mat to cool down. Repeat entire process with 2nd batch of the omelette. Cut the stems off the asparagus. 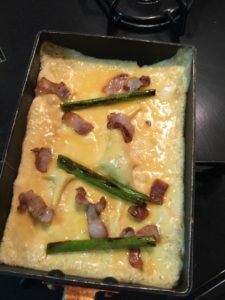 In a large pan, cook the bacon and asparagus for 5 minutes on medium heat. The oil from the bacon will help cook the asparagus. Mince the bacon into bits. Cut the asparagus stems into 2. 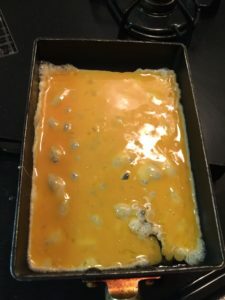 Add 1/6 of the eggs into the pan and make sure all areas are covered. While the omelette is cooking, add 1/2 your bacon bits. 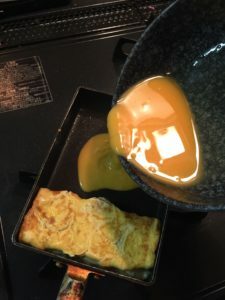 Once you can't see any runny egg on the surface of the omelette, you'll want to flip it. 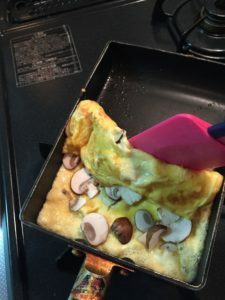 Using a silicone spatula, carefully roll the omelette around 2 times to one side of the pan. Add another 1/6 of the egg mixture to the pan. 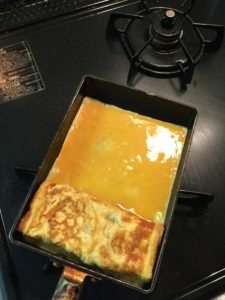 Carefully lift the omelette and make sure that the newly added egg mixture flows under the omelette so that each "layer" stick to each other. 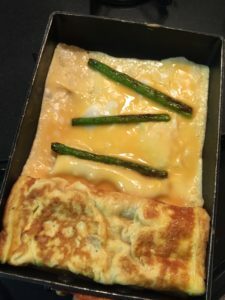 While the new layer is cooking, rapidly add 1/2 your asparagus. 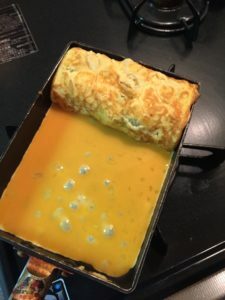 When the egg is done, roll again. 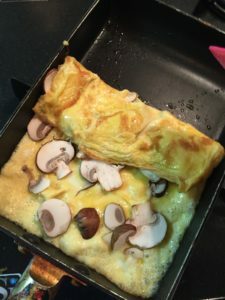 I just got the pan, can’t wait to make these!